Unwrap candy and place in freezer for several hours. Then chop in the food processor. Return to the freezer until needed. Place in an 8 quart bowl! This expands like crazy when you cook it. Microwave for about 90 seconds and stir until smooth. Add Jello and stir. Stir in the rice cereal. Spread in greased cookie sheet (13x18) with sides. Roll the top with a rolling pin to spread evenly. Allow to sit for two hours until firm. Cut in desired shapes. I made the wedges by cutting rectangles in half on the diagonal. Spoon over "cheese" wedges and top with plastic mice. (The mice came from Target...8 to a package and they feel really creepy and stretchy. Yes, I did wash them before I put them on the cheese. 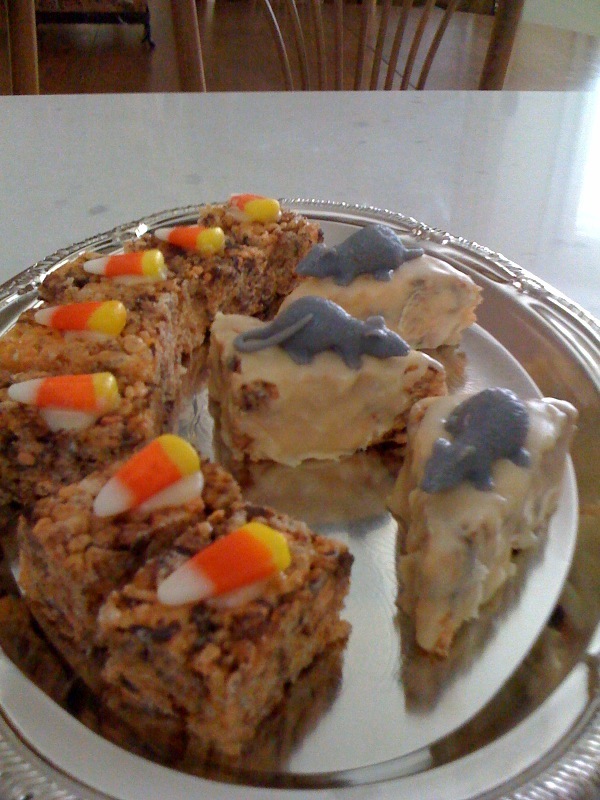 I made some mice krispies and cut the rest into 1-inch squares. I topped the squares with a corn candy and secured them with a dot of my icing. Allow the icing to set for about two hours. Store in airtight container. * If you can't find the candy sticks, I have also used Lindt orange chocolate bars. I used three bars and broke them into sections before I froze them. Then I chopped in the processor as per the sticks. Sweet Maryann is filling in for me this Halloween, as I have been held captive in bed with a fever, cough and cold. Hope to be back on my feet soon. Happy Halloween!!! Hey, we almost missed apple season with all the hoop-la from the Fashion Plate launch. I will try to get a few of my Fall recipes in before we focus on the holidays. This is Fran Neef’s recipe. My mom didn’t bake very much, but when she found something she liked, she stuck with it. Put apples in buttered 8 inch glass round or square pan and sprinkle with next four ingredients. Cook five minutes in microwave. Add a small amount of flour to apple liquid to thicken, if necessary. Add nuts and set aside. Sift the dry ingredients in a bowl and add milk, egg and butter. Mix until smooth. Pour over apples and sprinkle with an additional chopped nuts. Gidget, the original fruits and veggies girl, loves this recipe for apple cake. So does her boss. She dutifully brings it to work and hopes it will make Kenneth notice her burning passion for him. Her apple green cotton dress is trimmed in rick-rack and has button sleeve details. Even Xavier Cugat, her dog, gives it a big "woof" of approval. Double this custard recipe if using a deep dish pie pan (more then 3/4 inch sides). Mix sugar, cornstarch and salt in saucepan. Slowly stir in milk. Boil one minute over medium heat, stirring constantly. Remove from heat. Stir half of mixture into egg yolks. Then blend remaining eggs into hot mixture in pan. Boil one minute more, stirring constantly. Remove from heat, blend in butter and vanilla. Cool. Add 2-3 drops of yellow food coloring. Pour custard into pie shell, layering with bananas. Chill 2 hours. Maryann is suffering from raging PMS. She can't even decided what pair of shoes to wear. To make her life better, we'll make the world's easiest cake. My daughters were baking this cake from the time they were tall enough to reach the counter top. Maryann should have been more careful when she selected her bridesmaids, Veronica and Betty. They kept arguing and falling over during the photo shoot. I'm not sure whether they were intoxicated or just trying to upstage the bride. Here's hoping the actual wedding will go more smoothly. Oh well, on to the cake! Bake in a greased 8 inch round pan with 2 inch deep sides at 350° for 48 minutes. This requires a pan with higher than normal sides when baking one layer. Double recipe for 3 layer cake using regular size 8 inch round pans, bake 43 minutes. All the women in my Barbie Nation say, "Grin and bare it!" Take your mother, your sister, your grandmother or best friend to get a mammogram. What a wonderful way to say, "I love you." Betty waited until the last minute to don her lovely gown for the Red Cross fundraiser. She opted for red satin to match the cake she made for the raffle. Personally, I think it makes her look fat, but she wanted to wear it. She is hoping to meet some movers-and-shakers while she's manning the raffle booth. She tucked a few pictures from her portfolio in her purse, just in case. Lucy is a swimmer who teaches high school physical education. She owns the world's meanest cat, Ethel and is terrified of bees. She is following in her mother's footsteps by falling for all the wrong men. Lucy's biggest nemesis is financial...she can't balance her budget. Her solution? Get a credit card. Gidget works for a non-profit and has a heart of gold. She is an animal lover and ahead of her time; a vegetarian. Her father, Jim, is a cop and Myra's talents include being a champion pistol shooter. She carries a burning torch for her boss, Kenneth. Annette drifts through life in a clueless state. She survives on the generosity of men, who find adorable and want to protect her. She works as a receptionist and can pretty well make it through the day as long as the phone messages aren't too complicated. Maryann is a product of TCU Business School. Her finace, Ken, is a rancher and she is one of the few female CPAs. A ranch wedding is planned in a few weeks. Maryann loves horses and won quarter horse events in her teens. She is looking forward to starting a family.Of all the Barbies, she is the most domestic and an accomplished cook. Due to her retiring nature, only her parents and Ken know that she has a glorious singing voice. Ginger is a swinging single and the original party girl. Her job as a free-lance magazine writer keeps her running with the chic and hip. You'll frequently see her name in Maxine Messenger's column in the Houston Chronicle. She thrives on coffee and men. While she's all glitter on the outside, she fights the demons of her past: an abused mother, Katy and alcoholic father, Roger. If you were a fan of Archie comic books, you will remember Veronica and Betty. Well, I got pretty tired of the blonde always coming off as sweetness personified, so this go-round, Betty will be the villain and the brunette will be the sweet one. Betty is a divorced (heaven forbid in the 1960's!) woman from New York City. This unemployed actress migrated to Texas in search of modeling work, but she's slinging hash at IHOP while she's waiting for her big break. She doesn't "get" Texas culture, fears the giant cockroaches and wouldn't think of calling anyone, "Sweetie." Her sarcastic attitude and New York accent are cutting into her tips. She claims the only good thing in Texas is the Margaritas. Her dirty little secret? Her ex-husband, Kenny, is in jail. Veronica is the pride and joy of parents, Mary Nell and Beau. She is single and works as a travel agent. She is very familiar with every piece of equipment at the YWCA and rewards herself for keeping in shape by indulging in copious amounts of chocolate. Her dream is to write a best-selling novel. Veronica's shame is that her grand-daddy made the family fortune by running bordellos and white lightning.